JustisOne’s Key Passages are a really useful feature for revision and essay writing. The Key Passages show you the most commonly cited passages of a case and are automatically updated over time according to new subsequent decisions. Why is this useful? If you are looking at cases that have formed the basis of a legal test for a point of law, one of the Key Passages will often be the legal test itself, since this is the part of the judgment that is most commonly cited. 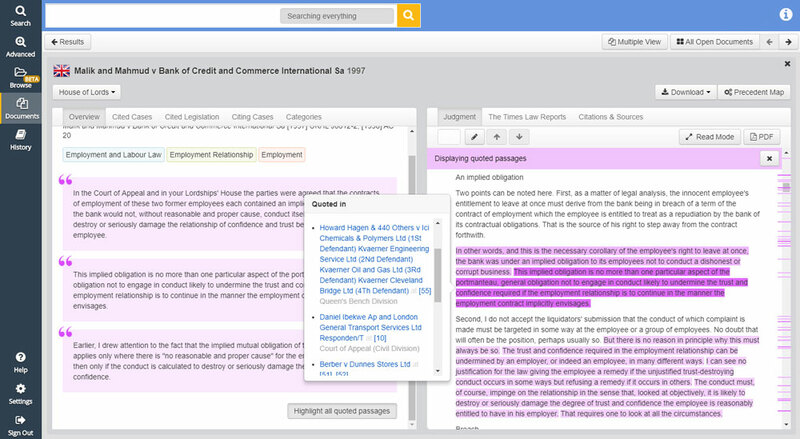 In this way, the Key Passages feature is a great way to quickly identify legal tests and the most important part of the case. As judgments can often be thousands of words long, the Key Passages feature essentially condenses the entire judgment into a couple of sentences, in order to decide if the case is relevant to your studies. What do law students say? “Writing essays during your LLM can be a daunting process. One of the main challenges can be how you convince your reader that your argument or view has merit. In this regard, JustisOne’s Key Passages feature certainly gave me confidence. This feature provided me with specific text of what others cited the most, in most cases, it was a crucial part of the judgment. I could also see where throughout the judgment other parts had been cited. I was able to see this information instantly, without reading through the entire judgment. However, you need to remember that sometimes reading an entire judgment is advisable. The Key Passages feature is a great guide to find what others find most useful within a judgment, but you will still need to understand the context of the case! Where can I find the Key Passages feature? Firstly, open a case in JustisOne that you are researching. 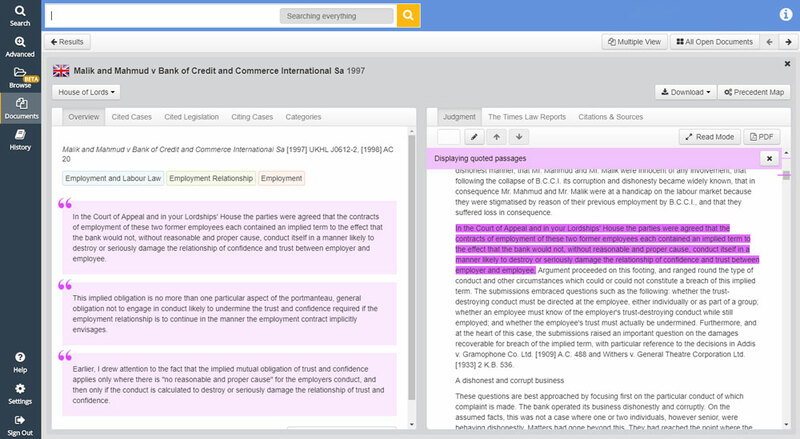 The Key Passages are initially displayed in the left-side panel of a case overview, as shown below. These are the passages that have been subsequently quoted most often, and arguably the most influential parts of the judgment since it was handed down. To see these passages within the judgment, simply click on the one you wish to see. To see every sentence of the judgment that has been subsequently quoted in a later case, click the Highlight all quoted passages button. This will place a heatmap over the judgment text to indicate which sections have been cited most often. Click on one of these Key Passages to see which other judgments have quoted that section, and where within the judgment you can find the reference. If you click on either the case or paragraph number in the pop-up list, you will go directly to that subsequent judgment or relevant passage.